Oh how I love, love, LOVE this manicure, and I'm sure you all are going to agree. It is serious perfection, and it was dreamed up by the amazing Nicole of Young, Wild, and Polished. If you are unaware of Nicole, you need to head on over to her blog or Twitter, or Instagram and take a gander at her gorgeous nails. She is the queen of the kitchen sink manicure, and of course dot-icures. 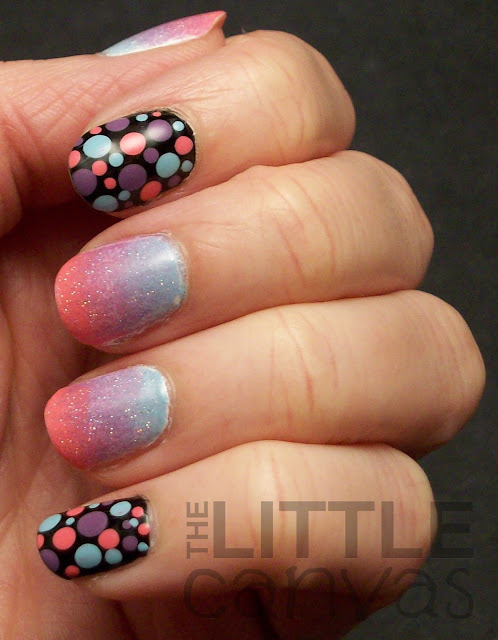 Back in November, I attempted some dotted flowers and copied one of her manicures. It by far turned out to be one of my all time favorite manis. Now, this manicure has become my new favorite. Nicole posted this gorgeous dot mani mixed with a beautiful 3 color gradient. As a lover of purple, pink, and blue, I immediately fell in love. I stared at it on Instagram, drooled over it on twitter, and needed to copy it. Since I received some new dotting tools from the Born Pretty Store, and some amazing new polishes from Sally Hansen, my time to attempt this manicure had arrived. Here's how they turned out. Oh how I love my lightbox, the pictures are coming out so much better! Sally Hansen Insta-Dri - Blue Away! I'm so happy with how this manicure came out. My dotting skills have far improved, along with my gradients. I can partially thank the amazing Sally Hansen Insta-Dri polishes for this. Dotting with fast dry polishes I thought was going to be a huge problem. My Sinful Colors Black on Black which I frequently dot with tends to dry up and leave those awful little lines behind. These Insta-Dri polishes did none of that! Working with such bright colors on a black base would have shown this, but clearly you can see that I had perfect dots each time. The Sally Hansen polishes were just AMAZING as well when it came to the gradient. As I normally do when creating a gradient, I start off with some white undies. Then, on a make up sponge, I paint on the colors I want to gradient For this manicure, I started with a swipe of Blue Away! at the top, then Tutu Cute, ending with Fuschia Flare. After sponging twice on the nail, I didn't need to go back and touch up the gradient at all. Typically I do, but with these polishes, I had no issue. I added my top coat and the gradient blended perfectly. I was nervous that since they were quick dry they wouldn't blend as easily, but boy, they did and it was gorgeous. I cannot wait to use Blue Away and Fuschia Flare as bases in manicures. They're the perfect, bright, cream polishes. 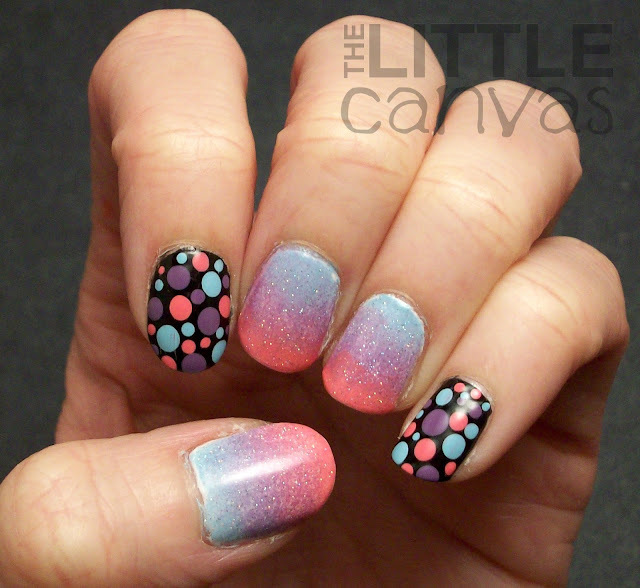 After seeing how they work with a gradient and dots, I am convinced they will make the perfect bases! Beyond gorgeous, if you need a baby blue polish or a bright pink perfect for Valentines Day, head on out to the store and purchase!!!! They're must haves. Can I also say how AMAZING Born Pretty's dotting tools were?! The dotting tools I received were these! There are 5 dotting tools with 2 dotters on each size, giving you 10 different sized dots. Amazing. The polish adhered to them amazingly, and the tools themselves were simple to use! They weren't too light, and they weren't too heavy, so I was able to maneuver them with both hands with ease. If you want your own set, head on over to the Born Pretty Store to purchase some!!! Use the code below to receive 10% off! Now that I have rambled and rambled, what do you think?? Do you love this manicure? Think Nicole is a genius? Thank you Nicole for the idea and continually inspiring me!!! <3 One more post and I might be starting some Valentines Day Manicures....are you excited?! Thank you!!! 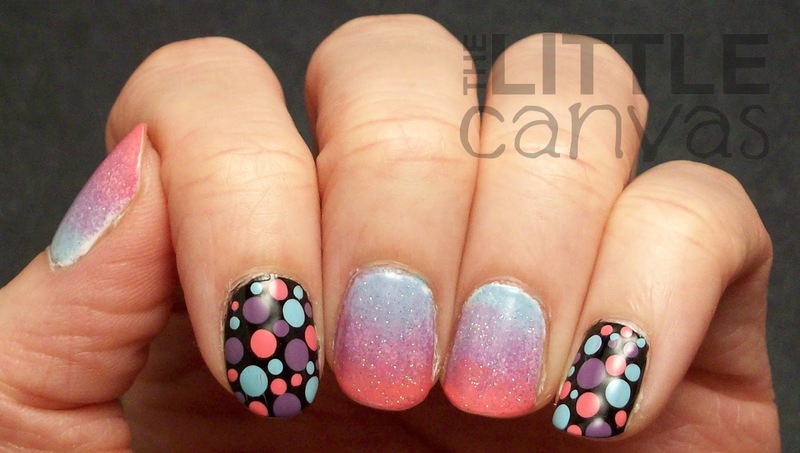 I really loved this manicure, and it's become one of my most viewed blog posts! I just saw another manicure she did today that is to die for and I already told her Im going to copy it. I feel so unoriginal doing so, but omgosh it's worth it. Gorgeous! The lightbox is definitely helping - your pictures are coming out wonderfully!